1. To prepare the oranges, use a serrated knife to slice a horizontal disc from both ends, exposing the orange flesh. Now work around the orange, slicing all the skin and pith away in vertical strips around the fruit. Horizontally slice each orange into 0.5cm-thick rounds, reserving any extra juice. 2. Make a dressing by combining the lemon juice (and any reserved orange juice) with the honey and olive oil; season. 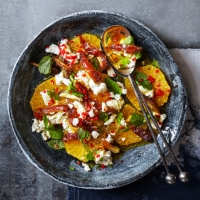 Gently toss together the orange slices, chilli, mint leaves and dates, then divide between serving plates. Dot with the goats’ cheese and drizzle with the dressing before serving.